Three teenage schoolgirls have simply disappeared from the streets of Melbourne in broad daylight, two of whom turned up dead weeks later. No arrests have been made, and it’s a topic on everybody’s mind, particularly other girls who might have known, or known of, the victims. Nobody feels safe anymore. 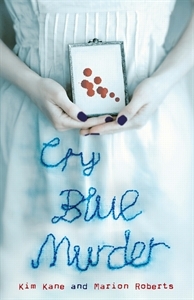 In this highly original YA novel, the authors explore what might make a seemingly intelligent, sensible girl willingly enter the car of a killer. The answer: she trusted the person in the car. Or more precisely, the killer was very calculating and knew exactly how to gain her trust. Told mainly in the email conversation between two fifteen-year-old private schoolgirls, Celia and Alice – interspersed with snippets of newspaper articles and transcripts of police interviews – the story explores how a pernicious stalker might groom somebody into trusting him. The girls discuss their personal lives; both feel alienated, are vulnerable and need a confidante, all factors that make a child a higher risk of being preyed on. Clues are scattered throughout the narrative; the killer is closer than our narrators might imagine. He lurks, weaving his web of lies, baiting a trap that might spring at any moment. A chilling psychological thriller, a page-turner that had me hoping that the killer might slip up and have the tables turned on him. I generally find epistle narratives dry as they rely on ‘telling’ rather than ‘showing’, however this one shines with the voices of both main characters. This is the authors’ first collaborative project, although both Kane and Roberts have already published a few novels. I hope they keep going.